I’ve quite obviously not written a thing on my blog post for months and months and you’ve all forgotten I exist anyway. If I choose to one day engage with writing on my blog again would you still like to receive postings? Soon after leaving my staff photographer’s position on the local newspaper where I’d been employed for the previous 5 years and with the luxury of in-house film processing no longer a convenient option I began using my local city centre professional colour lab, in Coventry. During the accumulating hours I spent in that lab waiting for my 35mm films to process, watching small colour prints dropping from the conveyor belt from the end of the machine, I very watched a short Indian man shuffle in through the door of the lab collect a small package of photographs then shuffled back out again. It was not until 2015 I discovered that the diminutive and unassuming figure was Mr Maganbhai Patel, the photographer known as Masterji. Masterji left his home and job as a mathematics teacher in Ahmedabad, Gujarat soon after India gained Independence from the British. He arrived in the prosperous English city of Coventry to meet up with friends and many other recent migrants from India in 1958. To earn enough money for food and board he took a factory job, sharing cheap accommodation with his Indian friends. This was not Masterji’s future – he had come across the world to make his mark. Masterji had been nurturing an interest in photography, bringing with him from India a Box Brownie camera he used as a hobby. Unfulfilled with his mundane day-job, Masterji soon sought the company of creatives and struck up a friendship with local studio photographer John Blakemore, who was at the very beginning his own illustrious photographic career. Time spent on evening courses at Lanchester Polytechnic and weekend courses with the GEC Photographic Society led to work, including photographing the visit to Coventry of the Indian High Commissioner and then onto portraits of the burgeoning south-Asian community. This led to a 1962 licence to start the Master’s Art Studio on Stoney Stanton Road, Coventry, which still exists today. Even though I have been printing my own black and white photographs for thirty years I have little experience of printing from other people’s negatives. It is harder than you think, though no job properly done is ever straightforward. I recently printed my grandfather’s seventy-year-old 35mm panchromatic safety film for exhibition. A friend, the photographic historian Pete James (@patinotype), advised that grandpa’s old negatives might print a little ‘soft’. His considered assumption turned out to be spot on: whilst handling these rare artefacts, damage was always an ever-present possibility. A few months ago, I began working closely with Masterji’s daughter, Tarla, in Coventry University’s darkroom. We began to sort through her father’s negatives on the lightbox. I was in luck that Tarla is a keen analogue printer. We dusted off her fathers negatives with a soft brush and compressed air, and then tentatively placed the first negative (single cut) in to the negative carrier. After the first exposure and development, it was immediately apparent from viewing the first test strips that a thorough cleansing process was necessary. Through his negatives, though debris was not visible to the naked eye, it had accumulated on to the surface of the emulsion. As with the majority of archives, Masterji’s negatives had not been kept in the most suitable of conditions: Tarla admitted that the archive was chaotic! Using a couple of droplets of photo-flow (fairy liquid original) and a little patience, Tarla and I began to first soak then gently wash Masterji’s old film. This is not an easy process when his medium format film had been clipped from its ‘real’ into a singular 6×6 format, making safe handling and drying without damaging the films emulsion a delicate task. For me, this was the most nerve-racking process, but I could see from Tarla’s expression it was painful for her to watch too – this was her father’s life work, an Indian immigrant who had refused the menial jobs for migrants to be an artist. Those tough times were captured on this film, and we were the ones responsible for securing this legacy. We had begun a restoration project. When British photographer Bertrum Edwin Ebenezer Scott disembarked from the train in Karachi in the days following the partition of India and Pakistan, he took a picture that would mark the end of nearly 150 years spent by six generations of his family in the subcontinent. 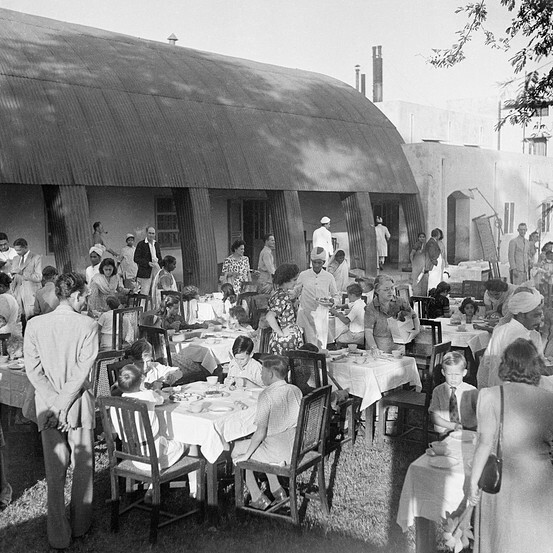 ‘The Last Breakfast in Karachi,’ taken before Mr. Scott boarded a ship in the port city of newly created Pakistan and set sail for England, is part of a collection of images he shot in India that are now on display at the Herbert Art Gallery and Museum in Coventry in the United Kingdom. 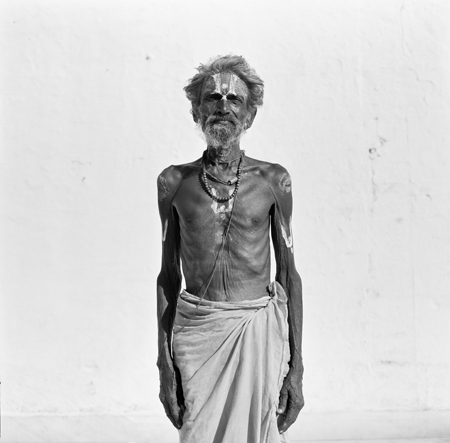 “The People of India,” also includes photographs taken by Mr. Scott’s grandson, Jason Scott Tilley, who put together the exhibition that spans more than a century of India’s history. Mr. Scott grew up in southern Indian city of Bangalore with his grandparents – Edwin Ebenezer Scott and Emily Good Andre — before India gained independence from the British. His grandfather was the Assistant Commissioner of Salt for southern India. 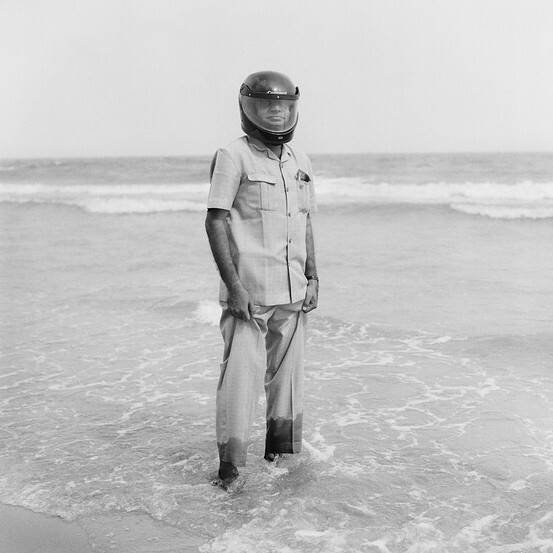 Mr. Scott became a press photographer for The Times of India before moving to head the Indian Army’s photography unit stationed in Burma during the Second World War. His work forms a valuable photographic account of India in the pre-independence era but many of his photographs have remained in his grandson’s closet until now. 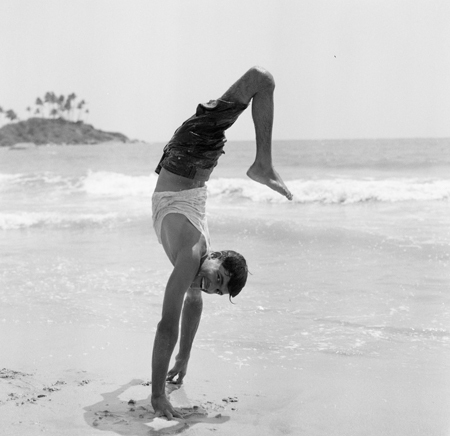 About 40 of Mr. Scott’s photographs are currently on display combined with more than 50 portraits of Indians taken in India by his grandson between 1999 and 2009. 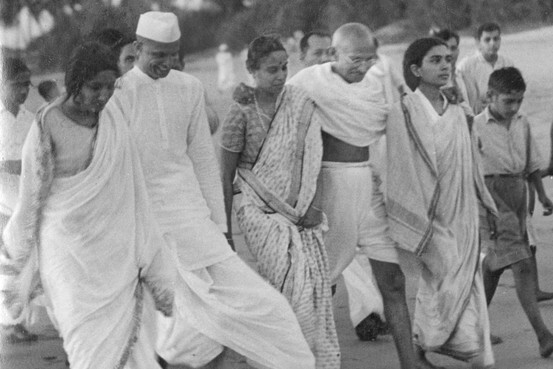 This photograph below, was taken by Mr. Scott in 1937, while Mahatma Gandhi, known as the father of independent India, walked on Juhu beach in Bombay, now Mumbai. 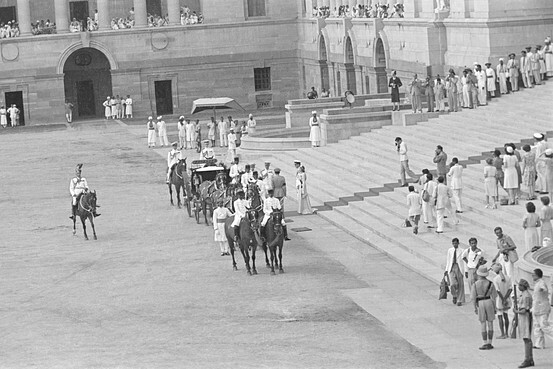 The image below is of a farewell ceremony held in New Delhi for Louis Mountbatten, the last Viceroy of India who was made the first Governor General of the independent country before leaving on Aug. 15, 1947, India’s independence day. 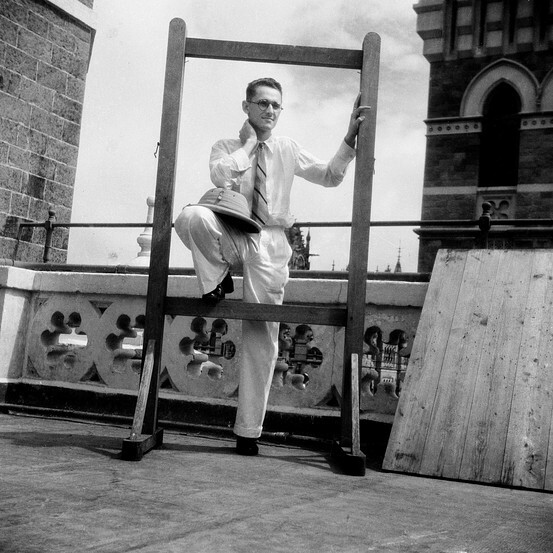 This 1934 photograph is described by Mr. Scott Tilley as the ‘Selfie of the 1930s’, and shows his grandfather standing on the rooftop of the building belonging to The Times of India office in Bombay. 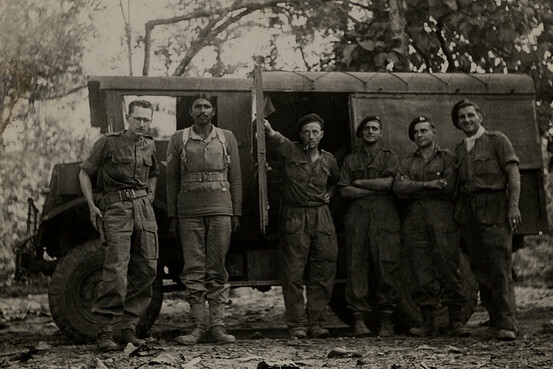 Mr. Scott Tilley first came to India in 1999 accompanying his grandfather whom he says “was desperate to go back to the country he loved.” In the photograph below of the Indian Army’s photo team in Burma, Mr. Scott is on the far left. Mr. Scott Tilley says his photographs, divided by almost 50 years from his grandfather’s pictures of the country, reflect a “new India”. 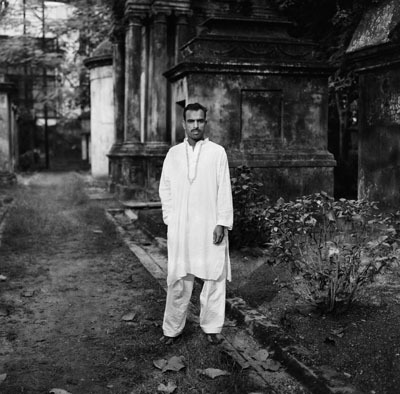 When he shot his first set of portraits while traveling with grandfather in the late 1990s, Mr. Scott Tilley said he “could see tragedy on the corner of every street” reminiscent of the stories of partition narrated to him by his grandparents. 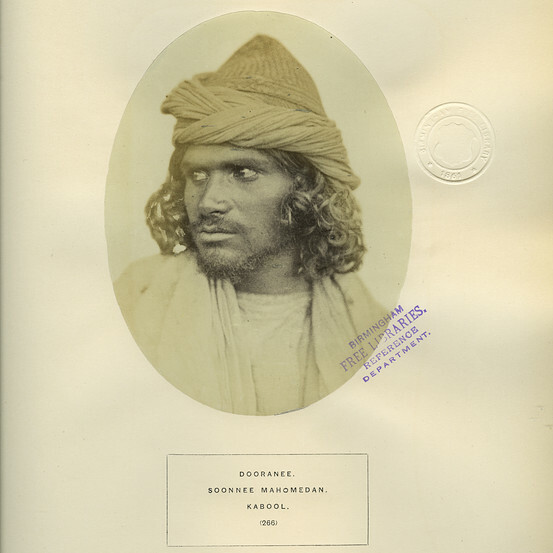 A third set of photographs in the exhibition come from a photographic project also called “The People of India” put together by the Library of Birmingham and spanning 1868 to 1875. The project was the outcome of the then “British government’s desire to create a visual record of ‘typical’ physical attributes and characteristics of Indian people to help them understand the population of the newly-acquired colony,” said Mr. Scott Tilley. 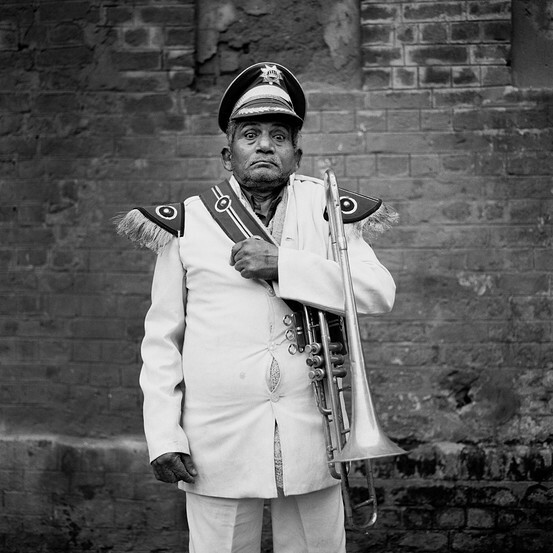 The photograph below is of a member of a wedding band and was taken by Mr. Scott Tilley in the winter of 2004 in Delhi’s Paharganj area. “What you can’t tell by the photograph is that behind me there are about twenty of his band members yelling at him to straighten himself up and stand to attention,” he wrote in a blogpost about the portrait. 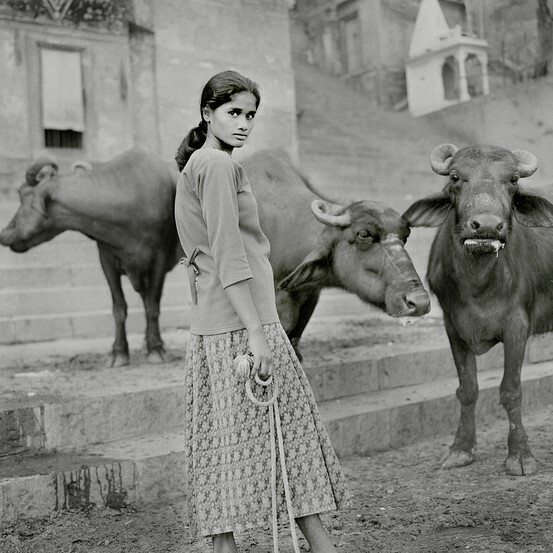 Mr. Scott Tilley calls this one, below, “The Buffalow Girl.” He took it in the Hindu holy city of Varanasi. 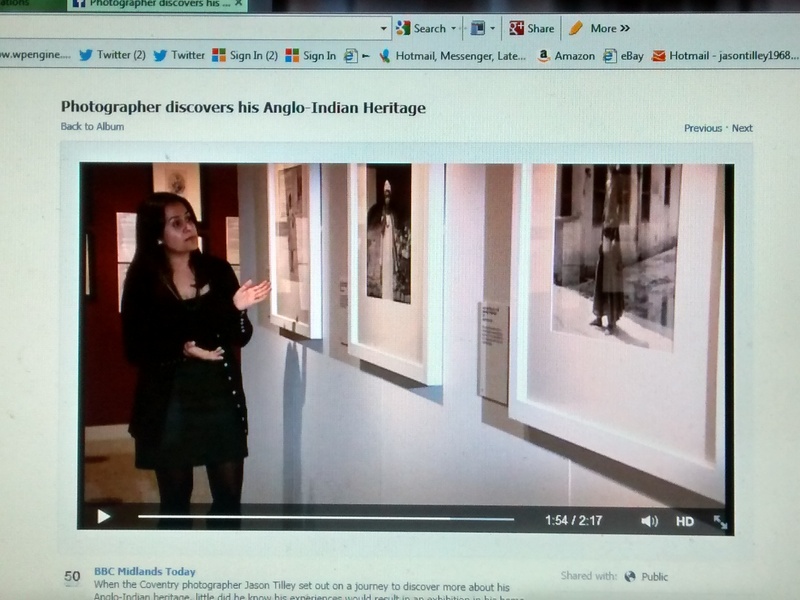 People of India Exhibition ‘video’ of our opening night. You wonder how I am the way I am. You never stop to know. And stopping in a sin. That melts my mother’s heart. The Poem was written by David Hurt, invigilator from The Herbert Art Gallery and Museum in Coventry, UK. It is Davids response to my People of India exhibition. And the mastery of a skilled eye. This poem was inspired by my People of India photographic exhibition at The Herbert Art Gallery and Museum Coventry. Thank you, David Hurt. The marketing of The People of India exhibition an my body of work The Beautiful people marches forward. Many many thanks to Satnam Rana and the team from Midlands Today for their professionalism and patience. Thank you to Stephanie Brown John Wilson and the team at The Hebert. Please click on the ‘Face Book’ link below this screen gab.